Over the years, many experts have highlighted the importance of teaching compassion to children. Compassionate people have increased empathy, may be happier, and are action-driven. 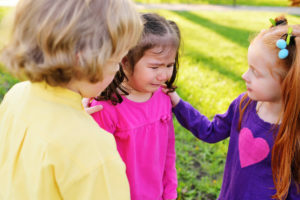 Compassionate children might be the key to preventing and stopping bullying. Teaching compassion involves more than simply teaching decorum and manners. What follows are ways to encourage compassion in children. Be a role model for compassionate behavior. Children learn from observing the actions of those around them.2 As parents and guardians, you are the first people your children see interacting with the world. The idea is to find the moments in life where you can stop and help someone to demonstrate that behavior to your children. Small acts of kindness go a long way. For example, help the elderly woman at the grocery store load items from her cart to the conveyor or shovel snow for a neighbor. Brushing the snow off of your car in a parking lot? Do the car next to you — just to be nice. Hold the door open for someone. Show your children that any time can be the right time to show compassion. Follow with discussion. As a parent or guardian, discuss compassion and prioritize it as a value for your family. This includes pointing out acts of compassion or kindness in real life, TV shows, movies, books, etc. Explain how small acts can be of big importance to those on the receiving end. Teach kids to show empathy for peers. When appropriate, encourage your child to imagine him or herself in the other person’s shoes. This gives them a way to actively think about how someone else is feeling and helps to explain his or her behavior. It helps your child find understanding and may motivate them to help. Get your kids involved in volunteering. There are many age appropriate ways to get children involved in community service. Think beyond raising money for schools and activities and look for ways to interact with those in need. Possible ideas include visiting nursing homes, helping out a homeless shelter, making cards for kids in the hospital, participating in a canned food drive, collecting clothes and coats for those in need, or participating with a local nonprofit through a walk. Be sure to connect the goals and missions of the group to the act the children are doing, so they can see how their time and energy helps those in need. Have kids help care for a pet. You don’t have to run out and get a dog! Surely you have a neighbor or a family member that has a dog or a cat? You can get your kids involved in the care of the pet through daily walks, feeding, and even occasional baths. Teaching your kids to care for the pets instills empathy, responsibility, and compassion. Plant a garden. While of minimal cost to get started (a few seeds, pots, and soil), a garden teaches children to care for a growing living thing. It also teaches patience and appreciation. It’s cold in Buffalo, but soon, you can start some seedlings in an empty egg carton from inside the house. Do you have any ideas to help your children become more compassionate?